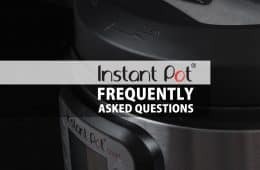 Learn how to make the Famous Hawaiian Instant Pot Spam Musubi Recipe (Pressure Cooker Spam Musubi). This comforting & yummy spam sushi is great for lunch or snack, picnics or potlucks. Super easy & quick to make at home! What’s to love about Spam? Hawaiians love their Spam ever since the World War II. 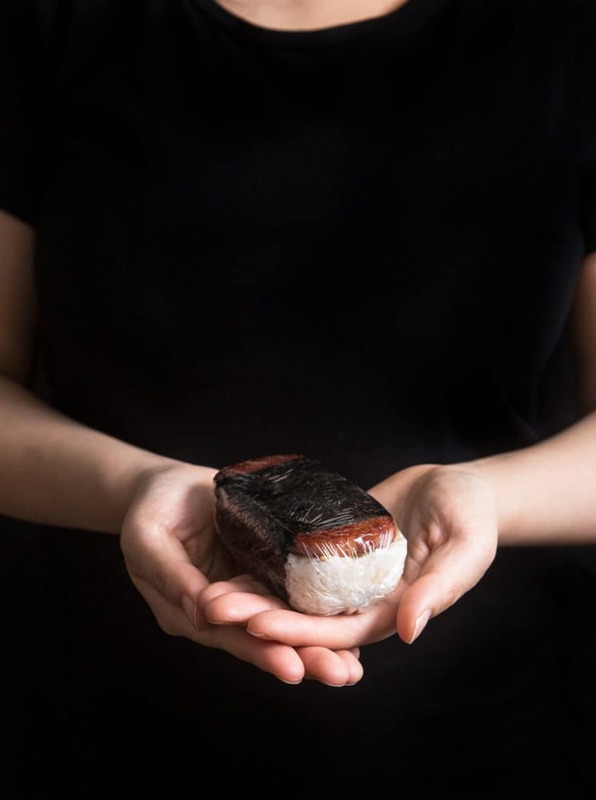 Inspired by the traditional Japanese o-nigiri aka o-musubi (white rice ball wrapped in nori seaweed), the ever so popular Hawaiian lunch or “to go” snack Spam Musubi was born! 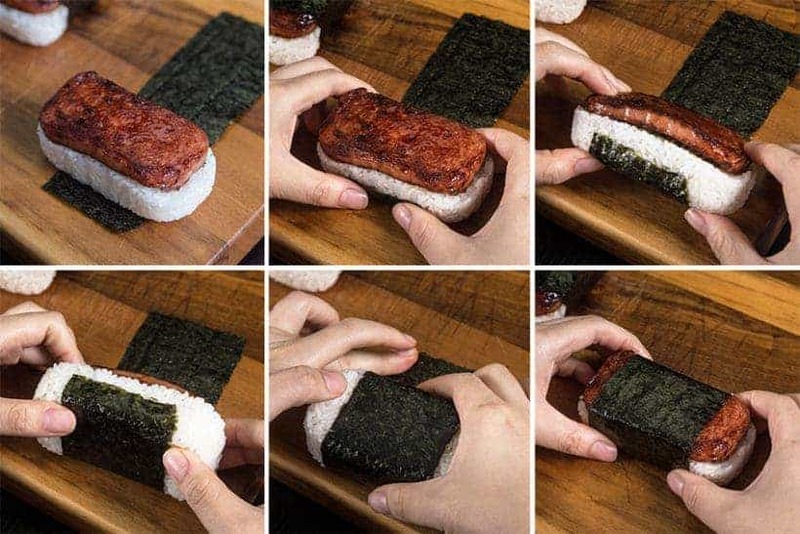 It’s literally a yummy Japanese Hawaiian Rice Sandwich: Rice + Spam wrapped with Nori (Seaweed). How can something so simple be so yummy?! The best part? Anyone can make this at home – yes, even kids!! This inexpensive & portable snack is super easy & quick to make. Time to host a Hawaiian sushi party! 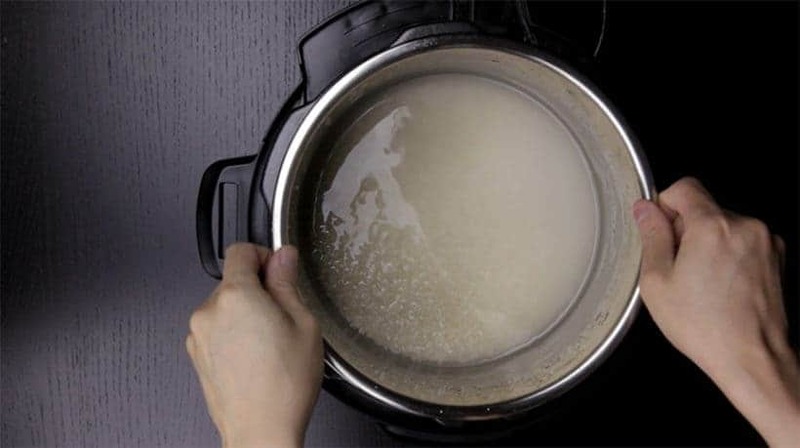 Gently rinse Calrose rice under cold water. Drain very well. 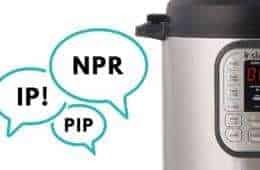 Place 2 cups (470g) medium grain Calrose rice and 2 cups cold water in Instant Pot Pressure Cooker. Fluff and set aside to cool to touch. While the rice is pressure cooking, mix 2 tbsp Japanese soy sauce, 2 tbsp granulated sugar, and (optional) 2 tbsp mirin together in a glass measuring cup. Cut 3 pieces of nori into 8 – 9 long strips. Open a can of spam, cut spam into 7 – 10 pieces. Wash & set the spam can aside as we will use it as a mold for the rice. In a medium heat skillet, brown each side of the spam pieces for 1 – 2 minutes. Brush sauce mixture onto each side of the spam pieces and caramelize for 10 – 20 seconds per side. First place a piece of plastic food wrap in the spam can. Pack portions of cooked Calrose rice in the spam can in the plastic food wrap (top left in the photo below). Then cover the rice with food wrap, and use your fingers to tightly press down the rice (top right in the photo below). 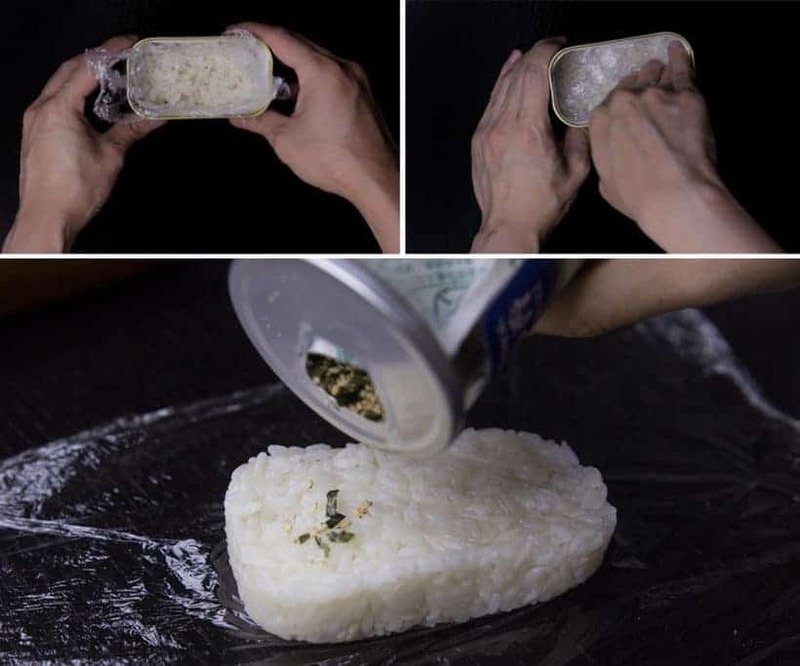 Remove wrapped rice from the spam can by pulling the food wrap upwards. Unwrap the rice and add a layer of Furikake (as shown in above photo). Place a piece of browned spam slice on top of the rice and wrap a piece of nori around the rice (as shown below). Rub out a few grain of rice on the end of nori strip as glue to seal the ends if necessary. Ta da! 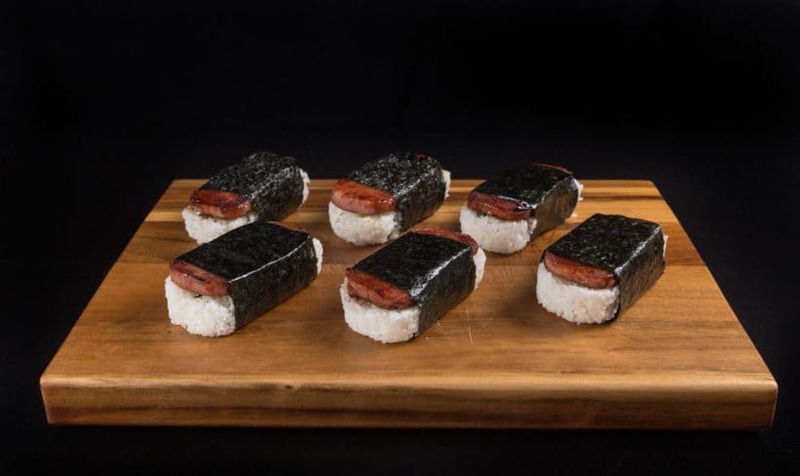 You’ve made the famous Hawaiian Snack – Spam Musubi!! 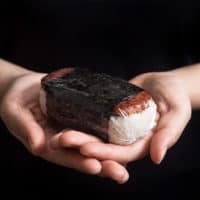 Learn how to make Hawaiian Instant Pot Spam Musubi Recipe (Pressure Cooker Spam Musubi). Ultimate comfort food spam sushi is super easy & quick to make! Rinse Rice: Gently rinse Calrose rice under cold water. Drain very well. 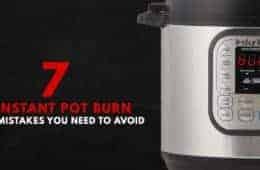 Pressure Cook Calrose Rice: Place 2 cups (470g) medium grain Calrose rice and 2 cups cold water in Instant Pot Pressure Cooker. Close lid and pressure cook at High Pressure for 6 minutes. Turn off the heat and Full Natural Release (roughly 10 mins). Open the lid carefully. Fluff and set aside to cool to touch. 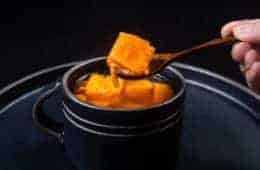 Create Spam Musubi Sauce: While the rice is pressure cooking, mix 2 tbsp Japanese soy sauce, 2 tbsp granulated sugar, and (optional) 2 tbsp mirin together in a glass measuring cup. Cut Nori: Cut 3 pieces of Nori into 8 - 9 long strips. Prepare Spam: Open a can of spam, cut spam into 7 - 10 pieces. Wash & set the can aside as we will use it as a mold. 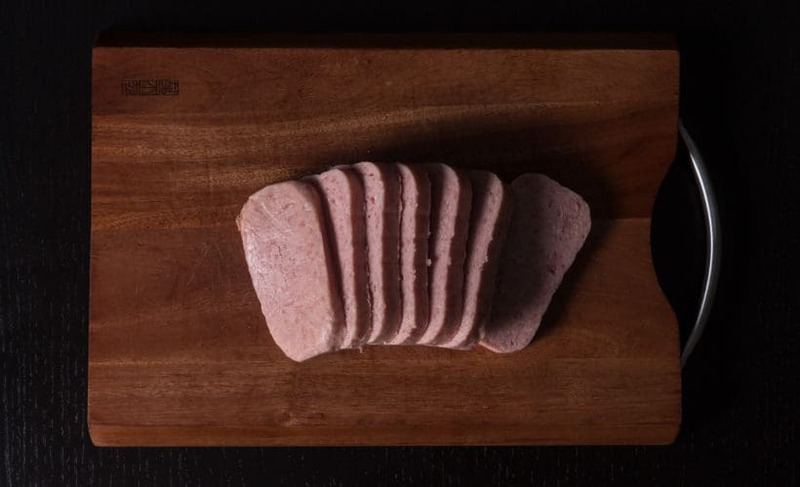 Brown Spam Slices: In a medium heat skillet, brown each side of the spam pieces for 1 - 2 minutes. Brush sauce mixture onto each side of the spam pieces and caramelize for 10 - 20 seconds per side. Set aside on a plate. 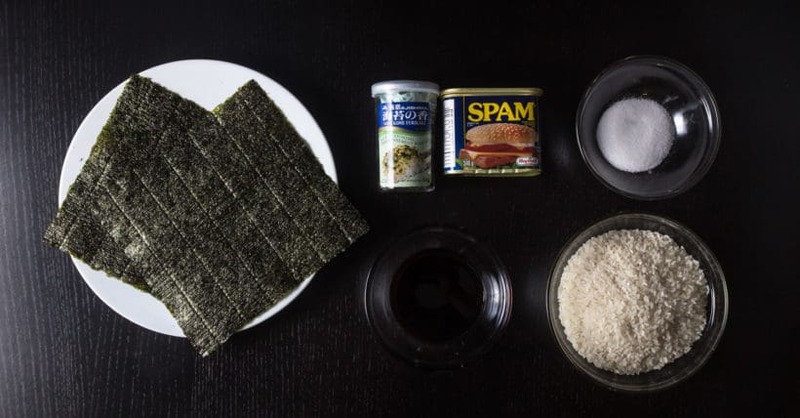 Create Spam Musubi: Place a piece of plastic food wrap in the spam can. Pack portions of cooked Calrose rice in the spam can and cover the rice with food wrap. Use your fingers to tightly press down the rice. Remove wrapped rice from the spam can by pulling the food wrap upwards. Unwrap the rice and add a layer of Furikake.Place a piece of browned spam slice on top of the rice and wrap a piece of nori around the rice. Use a few grains of rice as glue to seal the ends if necessary. Hi guys!! Can you double the rice in a 6 quart? If so are there any changes needed? My musubi is similar. I use Aloha soy sauce instead and of course to make life just a little bit easier … a Spam slicer and musubi mold are great tools to have. And when I’m super lazy, I’ll use Teriyaki Spam. Mahalo for your recipes. I always enjoy them. So amazing! I subbed prepared teriyaki sauce for the musubi sauce because I’m lazy 🙂 I always try to eat them fresh so the nori is still a little crunchy! Love your blog , thanks! 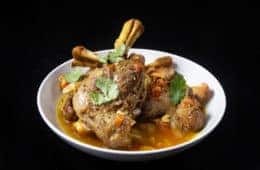 A treat to find this recipe on your site. I first had one at Azeka on Maui…also their fabulous ribs (how’d they make them??) 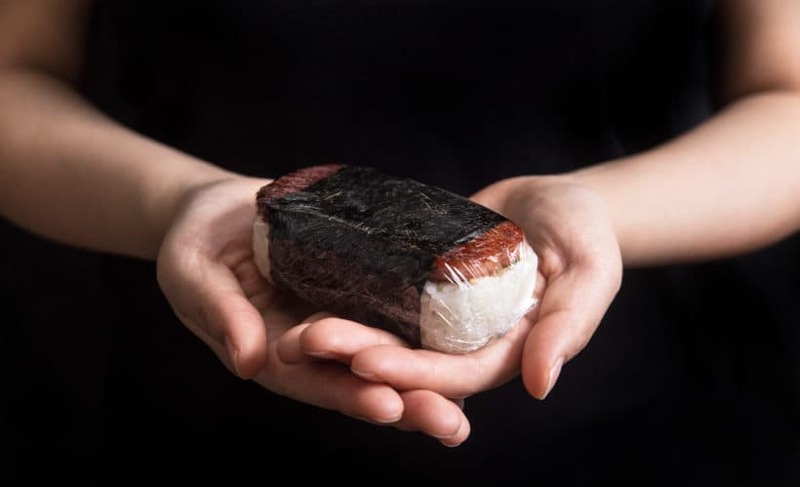 When I lived on Oahu in the 70’s I made hand-shaped musubi for the boyfriend (they were kinda triangular) with umoboshi in the middle (pickled plum?). His co-workers thought it was amazing that his haoli girlfriend would send him off with such a fine lunch! Can’t recall anymore how to form them the same way…no mould, just flip-flop by hand. 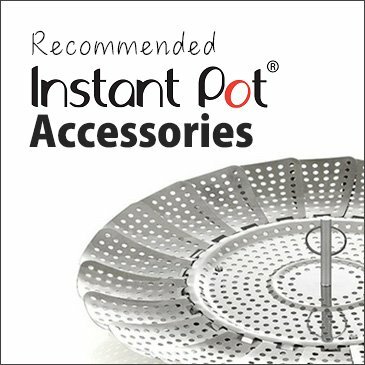 Thanks for bringing us such wide-ranging recipes and being dedicated to the electric pressure cooker…the way of the future! Thank you so much for sharing your story with us Vivian! Your recipes never fail!!!! Loved this!!! I’m looking forward to trying this out this weekend! Just a question — how would you tweak the rice recipe so you can also make sushi rolls (like makis)? Sushi rice will require portions of rice vinegar, salt, and sugar. Hopefully we can publish a recipe soon. A little bit of Kewpie mayo on the SPAM is truly transplendent. One can also forgo the musubi sauce use Tocino SPAM instead. Kewpie mayo sounds super yummy with the Musubi! Hi there, thank you for the recipe! What’s the dimension of cut nori? Thank you! It is roughly 2.5 inches x 8.5 inches. My husband would love this if I eased off on the rice. His low fiber diet is going fairly well and he has gained some weight back. I have used some of your recipes to tempt him. But, many call for rice wine or rice wine vinegar. I am SUPER allergic to it. I swell up like a balloon and hurt for 2 or 3 days. I can handle regular vinegar and sometimes cider vinegar. Will these work as a substitute? so happy to hear from you and your husband is gaining some weight back! For the recipes with rice wine, you can substitute it with sherry wine or water. For recipes with rice wine vinegar, you can substitute it with cider vinegar. I love Spam Musubi! I bought a musubi mold at Daiso a while ago, but haven’t used it yet. Now I will! 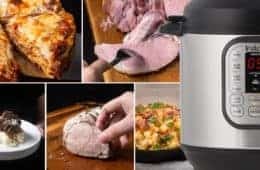 Thank you for sharing the spam slicer with us and our readers! !